Once activated the turbines will generate energy. They will be tied into the power grid to offset electricity costs and to serve as a demonstration project for I-10 Aesthetic Master Plan. The statement above came from the artist’s web site. We somehow find a way to build things but never seem to have the money to keep them working. According to this site we spent $7 million dollars on this. This entry was posted on Saturday, January 27th, 2018 at 6:50 AM and is filed under City government. You can follow any responses to this entry through the RSS 2.0 feed. You can leave a response, or trackback from your own site. Justathot. Ethan. Stop it now. Agreed. No need for threats. If the comment by Justathot is considered to be ok in this discussion, I think it’s time to leave. It’s easy to complain about public art and money spent. I’ve done my share. The city’s Public Art Ordinance that sets aside 2% from every Capital Improvement Project was adopted in 2006 by O’Rourke, Byrd, Ortega, etc. – the progressive Council that, though gone, left us a huge tab to pay. The committee that approves public art is a subcommittee of the Cultural Affairs Committee. Their meetings are open to the public. Anyone really opposed to the City spending money on public art needs to lobby his/her representative to repeal the ordinance. Anyone who has the time and inclination could go to every meeting of the committee. I think public art anywhere is hit or miss. The Tibetan flag roundabout near the Sunbowl and the hanging sculpture at the airport rental car facility are two that I really like and enjoy seeing. It just so happens that the I-10 egg beaters are seen the most and get the most comment. If you really don’t want City money spent for public art, talk to your rep and keep talking about repealing the ordinance. If you really don’t like liberal use of your tax money don’t vote for O’Rourke or Byrd for anything ever again. Just a note, the piece on the Glory Road&Sunbowl roundabout reflects the mandalas and flags of the Bhutanese-styel campus at UTEP! That $7 million price tag was for everything including the landscaping, cut-ins to the overpass, the new sidewalks, and the “egg beaters”. The city only put in $210,000 of the price tag and agreed to maintain it. I agree that the money could have been more useful elsewhere, but since TXDOT paid the lion’s share of the price, it was a good way of sprucing up a previously very bleak overpass… one that’s the first on that air travelers to our city usually see. Could someone provide an example of a similar “spruce-up” in another city? The vast majority of people who see this array are either locals or part of the I-10 travelers crowd, moving between the east and west coasts. Air travelers may well stop in a hotel near the airport or move to their destinations by Montana or US54, etc…Good that not all the funds came from El Paso taxpayers but like the Trolley, it’s money from public sources that could be used for something else…who decides? 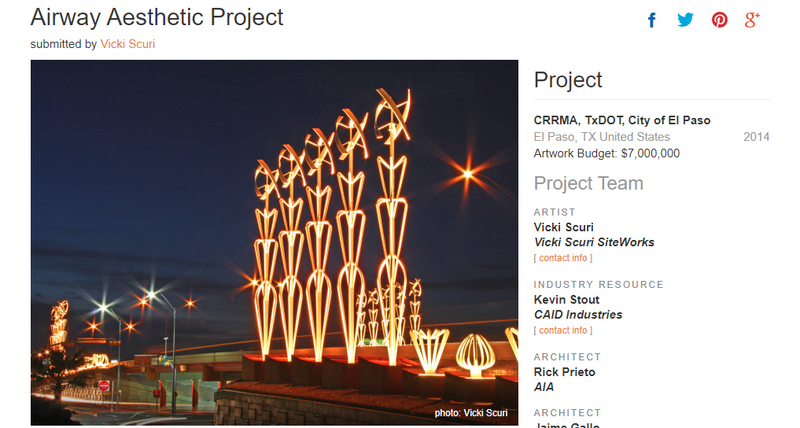 This eggbeater project is part of a massive Public Art program run by the Museums and Cultural Affairs Department with effectively no public input other than the MCAD advisory council. You may recall the complaint about one piece of art in a traffic circle in the Upper Valley which resulted in the removal of said art about two hours later at the order of City Manager Gonzalez. Some members of the public are more important than others…meantime, take a look at the new Heritage Corridor Archways on Cincinnati at Stanton and Oregon which give that Las Vegas feel to the “entertainment district.” What this has to do with Kern Place as a “heritage” area is hard to say. More archways will be going up around the city. Anyone remember anyone on Council asking for public input on the idea? Just more waste, tax, spend, tax some MORE by the POLITICIANS. This THING is an eye-sore, a distraction, a traffic HAZARD. Must have been some “Friends, family” of POLITICIANS that got the contract to build this thing. And after all this time, don’t work, so just adds to the city’s, TAXPAYERS electric Bill. Seems the ONLY people “In Charge” in El Taxo, are people that WE didn’t ELECT and so the WASTE, spend, TAX just continues. At some point . . . there will have to be money to . . .REMOVE them. Eventually, they will . . be. . . removed. And they won’t be good for anything else. But, these . . do nothing. The Streetcars and streetcar tracks will also have to be removed someday. It will cost another 100 million to remove and repair the streets. I see not too old . . .Mercedes for sale. Real nice looking for $3,000-$4,000. BUT . . . the maintenance and repair is sooooo high that you’d need to have “plenty of money” on hand to keep them running. Soooo, not so cheap any more. Buying into projects cost one thing . . but getting OUT of that project is another thing that might cost MORE than getting into that project. I don’t think city counsel . .EVEN . . thinks of such things. Or even asks . . . what REMOVAL would cost. Hiring an artist to generate electricity is almost as foolish as hiring a reality tv clown to be president. Some charities will only spend 90% of a donation on a project and reserve 10% to go ito an endowed fund for maintenance. I’m laughing all all the way to the bank as that reality TV “clown” has our economy booming, has virtually destroyed ISIS in 10 months, and has black and Hispanic unemployment at all-time lows, and has numerous American corporations moving back to the US and bringing millions of jobs back to America. I love clowns like that! $7,000,000 for non-working eggbeaters on I-10 is $2 million more than the City leaders earmarked for El Paso’s Hispanic Cultural Center that would be a source of city pride, esp. for our 83% Latino population and Mexico next door. Where are their priorities??? If we need a museum to instill pride, shame on us. Most of our politicians are Hispanic. They give lip service to the cultural center, but obviously it is not a priority for them. And when the community had an opportunity to raise money and build a bigger one, very little money got raised. In short, outside of a vocal few there isn’t much support. I do think Jud’s plan makes sense in terms of creating a heritage zone that part of population would enjoy, but I don’t think it would be a tourist magnet or something that would be a local “universal” draw. Yes, most local politicians are Hispanic or claim Hispanic blood, yet Jud keeps portraying local government as white men stealing the Hispanic heritage. Jud also keeps reminding us that 83% of the population is Hispanic, so by default the entire city is a Hispanic heritage zone. If the cultural center is so important to the Hispanic community, why haven’t wealthy Hispanics like Castro and Leeser written big checks to help fund it? Sage, I have never said that our leadership is white. It’s pretty obvious it’s a healthy mix of ethnicities. What I do say over and over is that our leadership continues to throw crumbs to El Pasoans when it comes to building on our culture. When leaders have no problem building Westside “natatoriums” (code for big effing pools) at a cost of $15,000,000 but at the same time will only pony uip $5 million for a Latino Cultural Center and suggest glomming it onto the Abraham Chavez Center…that is downright insulting considering the kind of city we are and our singular location on the border. You statement that all of El Paso is a Hispanic cultural center is plain ignorant. You don’t understand the concept of celebrating and respecting culture. It is so much more than you imagine. Is Portland an “Anglo cultural center”? Is Washington DC an “African American Cultural Center”? I love culture. I just think it should b privatized and not paid for out of tax funds. If done world-class (and we have the perfect location for it to be built as such here in El Paso in the Lincoln Park area) it would eventually gain a huge reputation and would possibly draw people (Latinos in particular) from everywhere, not to mention the possibility of Latino-owned businesses and corporations to consider parking or starting their businesses here.